Our Winter Season is rolling along @ Pogie's since we've moved the fun indoors for the season. Pogie's Clubhouse at 150 Jefferson St in Amherst provides an intimate and cozy setting for brunch, lunch, or dinner. We will be holding Pogie’s Supper Club there this winter. Pogie’s Supper Club is an intimate night out with a relaxed atmosphere, accompanied by live lounge music inside Pogie’s Clubhouse on Jefferson. Pogie’s Supper Club will benefit the Amherst Historical Society. 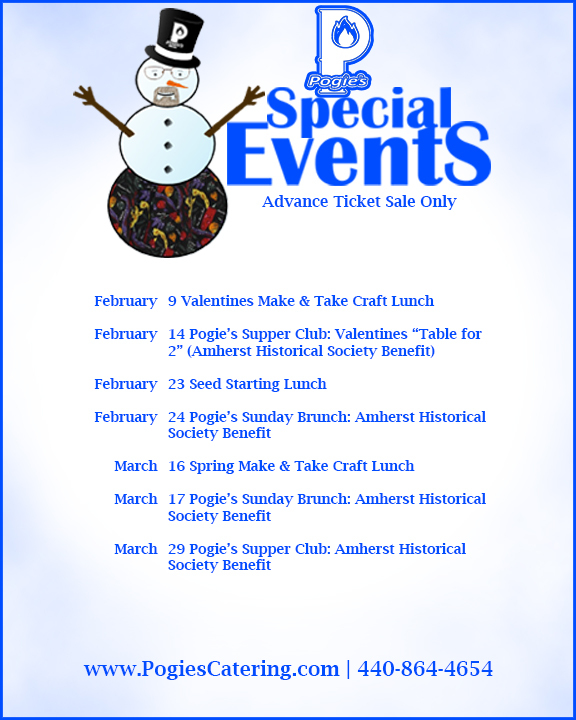 We will also be holding a monthly Sunday Brunch to benefit the Amherst Historical Society. Pogie’s Sunday Brunch will feature a classic brunch buffet done Pogie’s style, with specials like a carving station, eggs benedict & florentine, made to order omelets & breakfast sandwiches, and all the coffee you can drink. For the crafty and those who want to be crafty, come out and learn the basics at the Make & Take Crafting Lunches with Sarah. Workshops are guided by Sarah but are strictly DIY as you make your own version of the days craft. All the materials you will need for the days craft are provided but you’re free to bring any of your own unique materials! A lunch buffet is included and will be served by Pogie’s Catering. We’ll be adding to this list as the winter rolls on. We have a few different plans in the works to bring fun, food, and friends to Amherst this Winter. All events will be advanced ticket sales only so follow us on Facebook, join the mailing list, and check the website often for more event and ticket information as it becomes available. Come warm up with Pogie's this winter. It's always hot in our kitchen.